Tony Blair says he will ensure NHS targets do not stop people from seeing their GPs when they want to. The promise follows claims that some GPs' surgeries are refusing to set appointments more than two days in advance because of the targets. The Labour leader said he was "astonished" when the complaint was raised by a woman on BBC Question Time. Doctors' leaders say the target is crude. Labour says the target ensures speedy access to GPs for most people. After days dominated by rows on Iraq, the election campaign shifted focus to other issues on Friday. Mr Blair attacked the Conservatives' economic plan while Tory leader Michael Howard highlighted his plans for immigration. 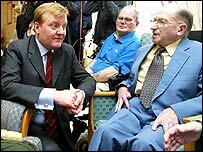 Liberal Democrat leader Charles Kennedy has explained why he thinks his party is offering the most generous deal for elderly people. All three main party leaders appeared separately on a BBC Question Time Special on Thursday to take audience questions. Mr Blair heard concerns about the effect of the government's target of ensuring people could get a GP appointment within 48 hours. Labour says GPs have already received leaflets on two separate occasions telling them not to prevent pre-booking. But audience member Diana Church said: "You can't make the appointment in a week because you are only allowed to make it 48 hours beforehand. "You have to sit on the phone for three hours in the morning trying to get an appointment because you are not allowed to ask for the appointment before that because by making it 48 hours beforehand they are meeting the government's target." When others in the audience concurred, Mr Blair said it was news to him, although the Tories said they had previously raised the issue with his ministers. Mr Blair admitted this interpretation of the targets was "absurd" and said he would look into it. The surgery concerned says it actually allows patients to book afternoon GP appointments in afternoons, although bookings for morning slots are only taken within the 48 hours. It says the doctor Mrs Church wanted to see was away on holiday when she wanted the appointment. The government's provisional figures for April suggest 2% of surgeries but could still involve several patients. Mr Reid said: "The situation is transformed and far better than it was seven years ago when the vast majority of people could not even see a doctor in eight to 10 days." He suggested the target could be altered to give more flexibility. There were now more GPs in practice and in training than ever before, but more were needed, said Mr Reid. There was also training available for doctors and receptionists on delivering both pre-booked and speedy appointments, he added. Conservative shadow health secretary Andrew Lansley said targets were causing problems across the NHS, and said a Tory Government would scrap them. He argued it was an "insult" to doctors for the government to suggest patients would wait longer without targets. 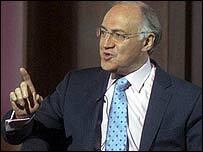 "Mr Blair is out of touch with what is going on in the NHS," said Mr Lansley. "It is his government that set the targets which distorts the way GPs want to run their practice and constricts patient choice." Lib Dem spokesman Paul Burstow said targets meant patients were let down. "These absurd political targets mean the sickest don't get treated the quickest its time to put patients first." On the GP targets, he said: "We've always felt that this has been a crude target which has distorted priorities." 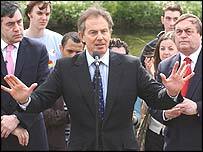 On the campaign trail on Friday, Mr Blair again argued the economy was the central issue of the election battle. He urged voters not to put economic stability and investment in public services at risk by letting the Tories in. Mr Howard told Question Time he would have invaded Iraq even if he had known Saddam Hussein had no weapons of mass destruction. Speaking in Cardiff on Friday, he renewed his calls for migration quotas and said his plans to change the asylum system would make it "more humane". The Lib Dems have focused on their plans for elderly people, including raising the basic state pension for over-75s by £100 a month and free personal care. What do you think about GP row?